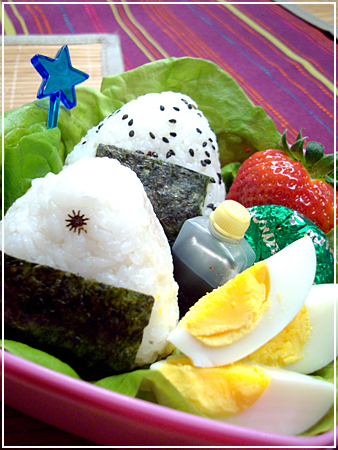 Rice balls stuffed with tuna and mayo (one plain and one with black sesame), strawberry, cookie, egg, soy sauce bottle. Happy year of the (were)rabbit! Bento #326 and a happy new year! First day back to work after the winter holiday hiatus today, and a new bento for tomorrow! 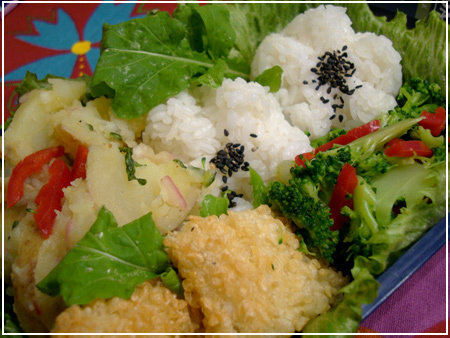 Crispy breaded fish, potato salad, onigiri flowers, rucola, broccoli and bell pepper strips. I found a new, super-low-budget flower onigiri mold! Do you know what it is??? Yes… it’s the bottom of a 0,5l soda bottle! Just cut that fella open at the bottom, wash it out, salt it lightly and stuff in your rice. Works like a charm and costs you nothing (except perhaps the return money on the bottle…). Third and last Tux design of the week, this time modeled after the round button-style icons you get in some window managers. 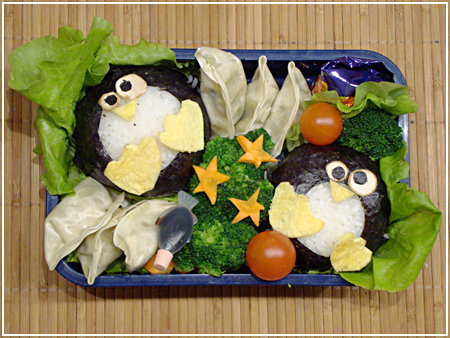 More onigiri stuffed with tuna, vegetarian dumplings, broccoli, carrot, tomatos, a candy and a fishy with soy sauce. Continuing the Tux theme with a Ninja Tux (hiding in front of a black background)! 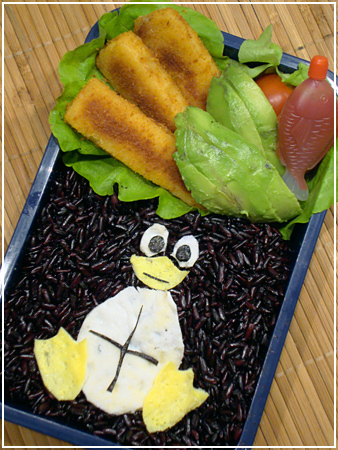 Since I think that cheese on rice or Nori is weird, Tux is actually made out of omelette. First I split two eggs and made an egg-sheet out of the whites, then I blended the yolks and the leftover white and made some more with the yellow part. 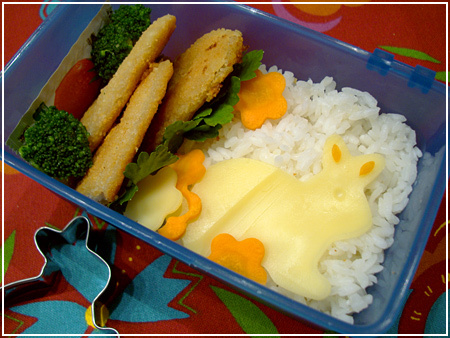 Worked pretty well, and I even have some left over for the next bento! 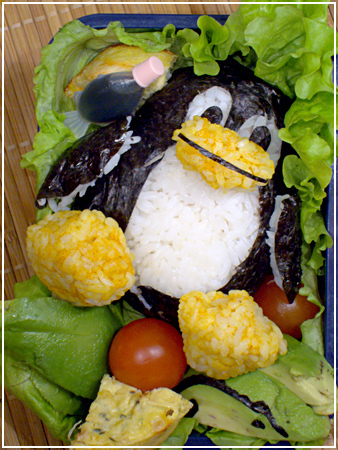 This weeks Bento Challenge is “Penguins”! I am a geek, so I had no choice. 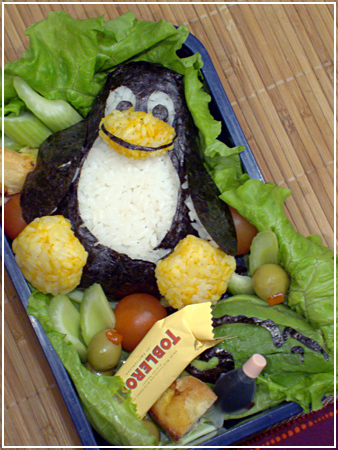 Tux is an onigiri stuffed with tuna (since any good penguin wants to be stuffed with fish!). The details are nori and rice coloured with turmeric. Then there’s cherry tomatoes, avocado (with a SuSE chameleon hiding on it), pieces of mini quiche, soy sauce fishy bottle, celery, olives and a Toblerone chocolate. If you’re wondering how on Earth I’m gonna close that one – I lost the lid to it a while ago, so I don’t have to worry about that <.<; I'm putting another box on top and tying it together with a napkin. The BF's closed fine, though. 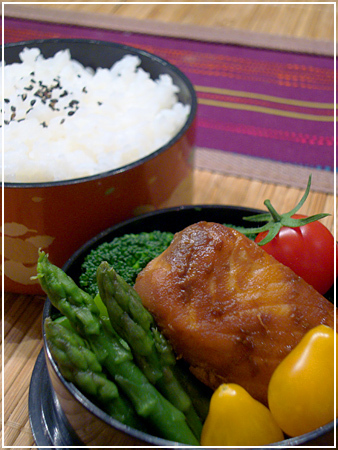 Teriyaki salmon, broccoli, asparagus and cherry tomatoes in the foreground, rice with sesame seeds in the background. Geek girls unite! I’ve been at the Swedish Geek Girl Meetup all weekend. On their site you can see me geeking it with some electronics!